It’s a little difficult to mark and copy text from a website when using a touchpad of your laptop or notebook, especially while traveling. 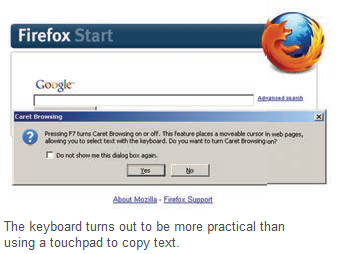 With the Caret-browsing feature, Firefox offers an alternative to navigate by using the keyboard instead of a mouse or touchpad. To switch on this function, open the command ‘Tools | Options’ and select the category ‘General’. Activate the option ‘Always use the cursor keys to navigate within pages’. Confirm with OK. The Caret-browsing feature can also be quickly activated by pressing the [F7] key. You will see a vertical cursor that marks the current position within the website in this mode. You can navigate easily to different areas and links by pressing tab key repeatedly. You can navigate on the page and mark texts with the help of [Shift] key. You can open the links by pressing the entry key. If you no longer wish to use the Caret-browsing feature than it can be deactivated by simply pressing the [F7] key again or by deactivating the option from Tools menu. However, Caretbrowsing can possibly causes problems with the scrolling key and moreover the links may not be open properly.